The modern users of technology hardly use a single device to connect to the world. The number of devices that are used by users are constantly growing. Most people keep switching between these devices, including tablets, televisions, personal computers and smartphones. If you will have any chance to make it in online business, you would need to design for multiple devices. There is even a bigger challenge as new screens are coming up in the form of wearable devices. This is a great opportunity for most business owners to reach as many consumers as possible. As a designer there might be a few challenges that you will face in creating an interface that will perfectly fit into the screens of multiple devices. The trend is getting more widespread with the necessity of the people to be online 24×7 and use whatever device that they get hands-on. 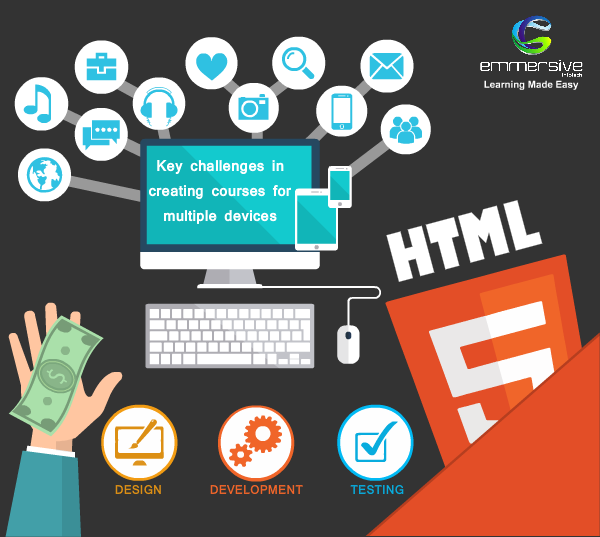 There are many vital things to be kept in mind at the time of producing eLearning content for the users using multiple devices so that all the text and images can be easily deciphered by the users. At the time of creating content, it should always be considered that all these need to load at different devices at the similar time. You should do everything possible to ensure that your website is in full speed on all devices. In order to achieve optimal speed, you should not have too many images as they may cause an overload on your website. The sizes of the files should also be contained, by using Java Script snippets, especially for the mobile users. You may also regulate the HTTP requests so as to allow maximum functionality of the web design on multiple devices. The main purpose of creating responsive design and its use is that the layout of the design adjusts to the device it has been loaded to ensure better visibility and interactivity. It has the unique ability to combine images and grids. The layout of the design will automatically change, depending on the particular device. With this technology, you can use a single URL to create a structure for your website, which will eliminate the need to create separate sites for the different devices. If you have to use responsive design, you would need to have proper planning as the costs can be quite demanding. However, when the design is in place, the maintenance may be less costly. The layout of any web application speak volumes about the product and its relevance in the particular market. As a designer, you should not overlook the layout issue. This has been a challenge for most people who are either used to mobile sites or desktop sites only. Now that you are working on a design that suits multiple devices, you should ensure the layout is perfect. Ensure it is user-friendly, has the right dimensions and use the right font. The various icons and buttons used should be descriptive to make it easier for users to navigate through the website, irrespective of the device used. This is a crucial consideration when designing responsive learning for the fact that the process can make or break an effective learning experience. While focusing on the development process, you should bear in mind that the process should be iterative and fluid. In these cases, higher testing time should be accounted in the development process. While developing the storyboard artists should focus more on the core content and the visual elements. The content should be always the main focus of any eLearning material and should incorporate all the important elements to adjust to multiple devices. Keeping that in mind, the other big challenge in designing for multiple devices is placing content in the right manner on all devices. You should not overload the users with too much content that may be irrelevant. The overall appearance of your content should be simplified so as to make it appealing to the users. All the key functions on your web page should be visible so as to make it easier for the consumers to access them and take the necessary action. From now on, at the time of creating elearning courses, you know what the factors to be considered in order to make it more productive, visually smart and user-friendly at all the time. In addition to these, we should allocate higher testing time in the development process to test the e-Learning on different kinds of devices. It will help in reducing the customer’s escalations after submission.